UFO Abduction Insurance Now Available – New Opportunity For Health Insurance Agents Facing Extinction? “Imagine going to a physician’s office and finding two waiting rooms. Since you are wealthy (even after taxes) and have “real” insurance, you are directed to the waiting room on the right. Comfortable lounge chairs, coffee bar and large full screen movie playing in the far end while computer stations on the other end for your personal use while waiting for the doctor. But alas, you won’t have much time to surf the net since waiting times in the room on the right averages 10 minutes or less. The health benefits community has been waiting for some force — a shift in employer preferences, a shift in insurer strategies, an upheaval in Washington or state capitals — to drop a hammer and smash everything to bits for decades. People have been watching for the hammer ever since managed care organizations came along and smashed Indemnity Plan World. Preferred provider organizations came along and loosened the grip of the health maintenance organizations, and health savings accounts came along and slowly revived the concept of imposing a meaningful deductible. But Managed Care World puttered along, never really changing in any dramatic way. Practicing Law Without A License? A recent post on another website regarding Medicare benchmark pricing (in lieu of a PPO), raises questions as to the legality of certain third party intermediaries representing patients vis-à-vis the provider under Cost Plus, Reference Based Pricing and other similar schemes which are gaining traction (and the attention of hospitals) in the market. This list Drug Costs(1) contains the actual average price pharmacies pay for nearly every prescription drug they buy. Not the AWP or list price or any other made up number, the actual price pharmacies pay! It’s amazing how much information is getting out now. Editor’s Note: Robert Cloutier is a fellow HealthCare Revolutionary and a friend of ours. His personal story of bringing transparency and sanity to the health care delivery system is stunning. Success of a product and service to the market depends on competition. To be competitive means not only having a pricing structure that consumers embrace, but quality of goods and services are equally important. No so in our current health care delivery system. For some employers, the PPACA brought with it a new motivation to self-insure the health coverage of their employees. Recently however, there have been hints that new legislation may be passed which will eliminate stop-loss insurance and therefore threaten the ability of many employers to self-insure. To counter this, legislation has been proposed in the Senate protecting the right of employers to fund their health benefits. Titled the “The Self Insurance Protection Act”, this proposed legislation protects the right of employers to continue to offer self-funded insurance plans and pay employee healthcare costs directly. Why Do Employers Do What They Do? How Do You Evaluate Cost Plus Insurance Through Competing TPA’s? Two competing TPA’s are quoting Cost Plus / Reference Based Pricing / Medicare Plus for ABC Fence Company in Brownsville, Texas. How does one evaluate these offers to determine best value? HealthSmart Holdings, Inc. announced today that it has entered into a definitive agreement to acquire Benefit Management Systems, Inc. and its affiliate Diversified Benefit Consultants, Inc. (collectively, BMS). Terms of the transaction were not disclosed. If you work with employer groups who need administrative support to help provide quality GROUP Retiree Medical and Rx benefits to better support retiree commitments, but are stretched thin in the HR Department, call us. We help employers get out of the benefits business and manage all phases of providing a quality Retiree Medical and Rx programs to Retirees and their Spouses, including policy issue, billing, claims payment and customer service. Many employers are ready to get out of the insurance business. CALL US TODAY… WE CAN ESTABLISH RETIREE MEDICAL PROGRAMS ANY MONTH OF THE YEAR. One of the surprising findings was that the average deducible amount found for each metal plan did not progress downward across metal plans evenly. 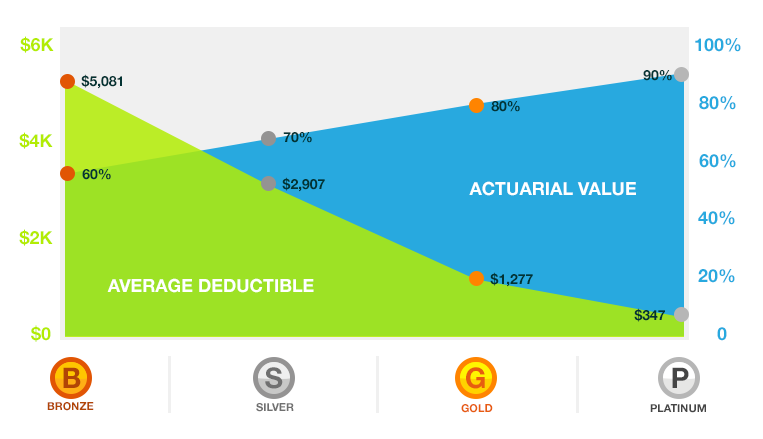 This finding was surprising because the actuarial value differences among the plans are consistently 10% more medical costs covered for each higher level of metal plan. For example, the bronze health plan covers 60% of medical costs for a typical enrollee population and the average deductible for a bronze plan across 34 state exchanges was $5,081. The platinum health plan, in contrast, covers 90% of medical costs for a typical enrollee population but had an average deductible of only $347. Assuming that actuarial certifications for all plans were correct, why would bronze plans that cover one third less medical costs than a platinum plan have an average deductible that was nearly 15 times higher than the average deductible for the platinum plan? The short answer is because the two plan categories are distributing cost-sharing in different areas. However, this answer does not explain the heavy reliance on deductible for cost-sharing among bronze plans. The findings our of our study help illuminate why it is so important for consumers to include their anticipated healthcare use within health plan comparisons. Shopping by premium alone could result in higher annual costs for healthcare if a person has moderate use of healthcare services. Lately I’ve gotten hooked on watching the Discovery Channel’s reality TV show, The Deadliest Catch. lt’s astounding to me what these guys go through to catch crab in the Bering Sea. Cost of care decreased and patient satisfaction jumped in a remote monitoring pilot project conducted by CHRISTUS St. Michael Health System in Texarkana, Texas, according to research presented this week at the mHealth Summit in Washington, D.C.
Much has been made about the promise of “if you like your current plan you can keep it.” But what if I like my Obamacare plan that I get in 2014? Will I be able to keep that? The simple answer is – No. The reason is that the new figures set forth in 2015 increase the maximum deductible from $2000 to $2150 and the out of pocket limit from $6350 to $6850. More on this in a minute. Lubbock, TX/San Antonio, TX – December 12, 2013 – Caprock Health Group announced today that it has completed the acquisition of the third party administration division of Employee Benefit Services (EBS). EBS is an established healthcare services company providing brokerage services, benefits administration, eligibility management and third party administration services. The EBS third party administration (TPA) division serves self-funded employer health plans in the greater San Antonio, Texas Region. The acquisition makes Caprock Health Group one of the largest health care services organizations in the region. The acquisition will continue Caprock Health Group’s strategic initiative related to geographic expansion, product diversification and growth. The merger of Caprock and EBS’s TPA will enhance the Caprock Health Group’s position as an industry leader in innovative plan management and cost containment services. “The Villemain family have done a tremendous job developing a high quality, service oriented Third Party Administrative firm. Caprock Health Group is proud to have been chosen to advance the EBS service model through our acquisition of EBS. EBS is a great complement to the Caprock Health Group of family companies. Their business model is a very good fit and they have great leadership who know our industry and will continue to support the self-funded employer groups involved,” said David Adams, CEO of Caprock Health Group. “Employee Benefit Services is pleased with the completion of the transition of our TPA Division to Caprock Health Group. We feel this acquisition of our TPA division will be beneficial for our clients, and at the same time, better align EBS’s services for long term growth,” said EBS President Pete Villemain. Employee Benefit Services is a full service Brokerage Firm. Family owned and operated for 25 years the Villemain family offers clients quality products and services delivered promptly at competitive prices. As a brokerage EBS works directly with clients to offer a full line of benefit products and services as well as consulting with employers on customized self- insured employee benefit programs. Through a mutually beneficial partnership, they promote a spirit of teamwork among clients, employees and vendors. Caprock Health Group is a health care services organization comprised of affiliated companies working in close coordination to provide an effective integrated solution for employers and insurance brokers who want the very best in self-funded health plan management and fully insured plan access. Caprock Health Group offers a full suite of products which are designed to provide each employer maximum cost savings. Our focus is helping employers manage long-term health care costs by empowering employees through education, creating healthier consumers, and incorporating highly effective cost containment strategies. Editor’s Note: With the recent acquisition of Verity National (http://blog.riskmanagers.us/?p=12168) and now EBS, Caprock is well positioned to become the premier TPA for the San Antonio area. Caprock provides competitive Cost Plus, Reference Based and Medicare Plus pricing models ( http://blog.riskmanagers.us/?p=12327) as well as traditional managed care plans. Medicare Cost Plus – Yes or No? ( Receptionist ) Hello, Welcome to ObamaFlowers, My name is Trina. How can I help you? Up To 11,000 Williamsport Dental Patients PHI Now Online – Need A New Identity? Neasham and his wife in happier times. ACA Religious Exceptions – Do Corporations Have Religious Rights Or Just The Owners? Editor’s Note: The Affordable Care Act requires certain employers who provide group health coverage for employees to cover certain birth control benefits. Some companies, and religious institutions have a fundamental, religion based objection to this mandate. Lawsuits are inching, ever so slowly, towards an inevitable ruling by the Supreme Court. Nov. 26–Austin Community College plans to reduce hours for some adjunct faculty members to avoid having to provide them health insurance under the federal Affordable Care Act. Editor’s Note: Why do exchanges, or anyone else for that matter, need to have networks of providers? Allow consumers to seek and receive medical care from the providers of their choice. Whether you go to Dr. Smith or Dr. Jones, the insurance plan would pay the same. It’s that simple. The Obama administration quietly finalized the Health Insurance Tax (HIT) over the Thanksgiving holiday weekend, a provision in Obamacare that will cost nearly $60 billion over the next five years and raise health care premiums by 3 percent. INSURED: Elizabeth, the pharmacy is calling me that the medication Matthew is needing is not covered by the insurance? There are two medications (1). Levofloxacin 100 mg (2). Mometasone 0.6 mg. He would need a 30 day supply can you check on this for me? ELIZABETH to PBM: Do you show anything in the system for XXXXXXX for these meds? PBM TO ELIZABETH: I just wanted to let you that we received a fax early this morning. Our clinical department is reviewing the information, and we should have a determination shortly. PBM TO ELIZABETH: We had one of our clinical pharmacists talk to the pharmacist at XXXX Family Pharmacy. We wanted to see if the pharmacist would submit a lower price for the medication, he is submitting a cost of $1,600+ when in reality the medication should only cost around $40…..but he would not. The main ingredient in this compound is usually around $5 per gram. The pharmacy is trying to charge $120 per gram on an expired NDC code (all drugs have NDC codes for claim processing). Because of this inflated charge, the pharmacist may say that we will not cover the compound. This is not the case. The compound is covered, but should only cost around $40. At this point we would normally suggest the doctor be called to try an alternative commercially available systemic antibiotic. PBM TO ELIZABETH: XXXXXX Family Pharmacy is attempting to charge $1,579.97 on a compound for Levofloxacin powder. According to prices we have on all the ingredients being submitted, the total cost should only be around $40. Please advise if the plan wishes to override the cost for this member and allow the pharmacy to bill for the full amount. ELIZABETH TO PBM: How is this applied? What are the directions? PBM TO ELIZABETH: I’m sorry Elizabeth, but those questions will need to be directed to the member, or pharmacy. These are not options that are supplied on an adjudicated claim. The only fields provided are ingredient, quantity, day supply, and cost. Also, I tried to call the pharmacy earlier to obtain the ingredients, and they would not give them to me, as I am not the doctor, nor the member. Of course, little did he know I can see the ingredients, I just wanted to verify. PBM TO ELIZABETH: Sorry, I had to have one of the pharmacists obtain the additional ingredients. Please see the ingredients, qty and cost being submitted by XXXXX Family Pharmacy: Levofloxacin Powder – 6.o quantity, $726, Mometasone Powder, 0.033 quantity, $6.17, Loxasperse Powder Base – 7.32 quantity, $841.80. ELIZABETH TO PBM: Have you seen a claim come through? What was the final price on it and how much does the employee have to pay? PBM TO ELIZABETH: Yes, the claim did pay. The group is being billed $63.57 and the member is paying $25. I guess the pharmacy was finally able to locate a cheaper NDC. This story has a happy ending. One pharmacy was going to bill about $1,600 while another charged less than $100 for the same prescription. Maxor National Pharmacy Services Corp. (Maxor) is pleased to announce that it has completed an asset purchase agreement for certain assets of Trident Plan Administrators, a Third Party Administrator based in Phoenix, Arizona with clients in Arizona, California, Kentucky, and Nevada. Maxor, based in Amarillo, Texas owns Maxor Administrative Services (MAS) which is a third party administrator (TPA) for self-funded health plans. MAS currently operates an office in Amarillo, and will now expand its operations to the Phoenix office, providing the same level of dedicated service to clients and members through both locations. In addition to expanding operations in Phoenix, MAS will be adding to its staff in Amarillo to help support the growth in both offices. MAS pursues and delivers innovative cost containment solutions that break the mold of traditional healthcare delivery to self-funded health plans, and the expansion furthers the growth of providing these services. MAS offers the knowledge and flexibility that is needed for self funded health plans to effectively manage their employee benefits. As the landscape of healthcare continues to change at a rapid pace, employers continue to search for ways to provide a quality, cost effective healthcare benefits package for their employees. MAS has experience in helping employers find unique solutions such as reference based reimbursement models or unique plan designs utilizing more conventional network arrangements. MAS provides accurate financial information about each component of their employee benefit plan and allows the employer to act on that information by selecting the service providers that best meet the needs of the Plan and its members. Maxor is a multi-faceted pharmacy services company with operations located throughout the United States. Since 1926, we have grown into a nationwide provider of pharmacy and healthcare services, including MaxorPlus, Ltd., pharmacy benefit management services; Maxor Pharmacies, retail and mail order pharmacies; Maxor Specialty Pharmacy and IV Solutions, specialty pharmacy services and home infusion therapy; Maxor Pharmacy Consulting & Management Services, providing inpatient and outpatient pharmacy consulting and management services; Maxor Correctional Pharmacy Services, providing correctional pharmacy services; and PickPoint, providing intelligent pharmacy solutions for remote dispensing systems, “will call” systems, and electronic medication administration records; and Maxor Administrative Services, administration of employee healthcare benefits. For more information about Maxor, visit www.maxor.com. Can Obama Baleout The Health Insurers? Risk Corridor: If a plan ends up with a surplus a formula is used to make payment to the federal government. If a plan ends up with a deficit, payment is received from other plans to offset the deficit.